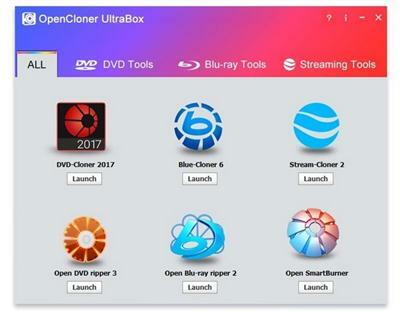 OpenCloner UltraBox is a 6-in-1 software collection including DVD-Cloner, Open DVD ripper, Open SmartBurner, Blue-Cloner, Open Blu-ray ripper and Stream-Cloner. They are categorized by DVD Tools, Blu-ray Tools and Streaming Tools. With OpenCloner UltraBox, you can copy/rip/burn DVD and Blu-ray movies and download/capture online videos from all video or video-sharing websites. Give it a try and enjoy the multi-functional software collection with more satisfaction and amazement! - A 6-in-1 software collection including DVD-Cloner, Open DVD ripper, Open SmartBurner, Blue-Cloner, Open Blu-ray ripper and Stream-Cloner. - Enables you to copy/rip/burn DVD and Blu-ray movies and download/capture online videos from all video or video-sharing websites. - Run any program in the collection directly, no need to download again. - Shows the main functions of any software in the collection. - Full 1:1 DVD copy from DVD-5 to DVD-5, DVD-9 to DVD-9. - Compresses a DVD-9 movie onto one DVD-5 disc with result-zero quality loss. - The inventive SRT?�? provides you the freedom to copy latest DVD movies through the optimized module. - Converts the DVD movies to various video and audio formats. - Supports a wide range of most popular multimedia devices. - Supports for converting 2D to 3D movies and setting the 3D features such as Red/Cyan, Red/Green, Red/Blue, Blue/Yellow, Interleaved, Side By Side, etc. - Burns a variety of data files to a blank DVD disc. - Burns video files with various formats to a DVD video disc. - Perfect 1:1 Blu-ray copy - makes a copy of the whole Blu-ray disc onto another. - Copies a Blu-ray disc to a blank Blu-ray/DVD/AVCHD disc or to the hard disk. - Customized copy - select your desired title(s) to copy and remove unwanted audio track(s) and subtitle(s). - Rips Blu-ray movies to a large number of audio and video formats. - Converts 2D to 3D movies and set the 3D features. - Trims your preferred clips from the video file and crops the unnecessary borders from the video screen. - Burns a variety of data files to a blank Blu-ray disc. - Burns video files with various formats to a Blu-ray video disc. - Downloads online movies, streaming videos, music, images, data files, etc from all kinds of HTTP protocols. - Downloads online videos from all video or video-sharing websites. - Captures streaming videos or anything playing on the PC. - Converts the downloaded and captured streaming videos to various video and audio formats for your convenience. - Plays back the downloaded/captured/converted video files with the software's built-in video player directly. - DVD-Cloner and Blue-Cloner in OpenCloner UltraBox have been updated. All times are GMT +1. The time now is 05:50.